I am WAY behind with EVERYTHING right now due to health woes, moving house and birthdays chez nous! I’m going to try and get on top of things a bit more from now on though as I have a massive backlog of posts to write and all manner of cool and interesting things to share with you all. Those of you with long memories may well recall that I paid a rather splendid visit to Buckingham Palace not that long ago where I was permitted to take photographs of the state rooms – a rare honour as photography isn’t usually permitted. We had a most splendid day and were pleased as punch when we were then invited to talk a short walk down the Mall to Clarence House as well. Like Buckingham Palace, some rooms of Clarence House, the London residence of the Prince of Wales and Duchess of Cornwall, are open to the public over the summer and it’s been a long held ambition of mine to take a look inside! 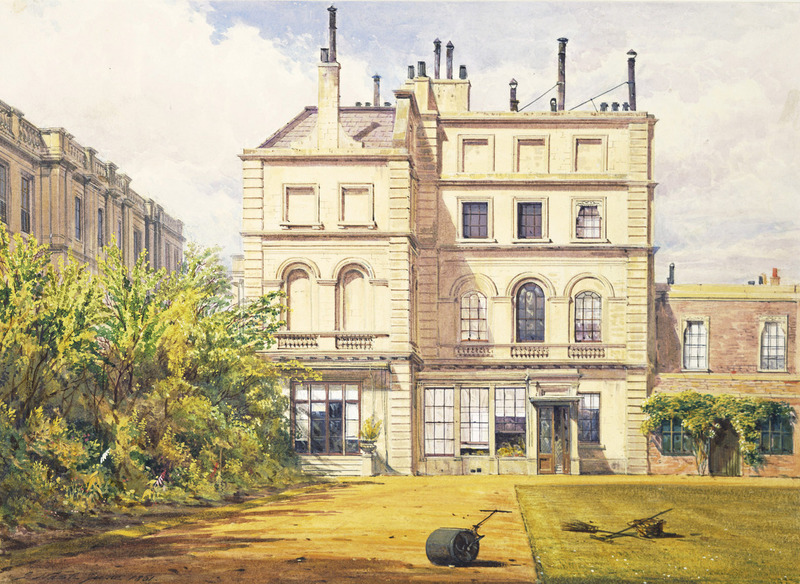 Clarence House, St James’s Palace: the garden front, Joseph Nash Jnr, 1861. Photo: Royal Collection Trust/© Her Majesty Queen Elizabeth II 2015. Clarence House is a little oasis of tranquility in the very heart of London – from the moment you step through the gates it really does feel like you have been transported away from the noise and chaos of the city and I can totally see why it has been such a much loved royal residence for so many years as it has the looks of an Italianate villa and the cosy feel of a family home. It really is delightful and a definite contrast to its near neighbour Buckingham Palace. 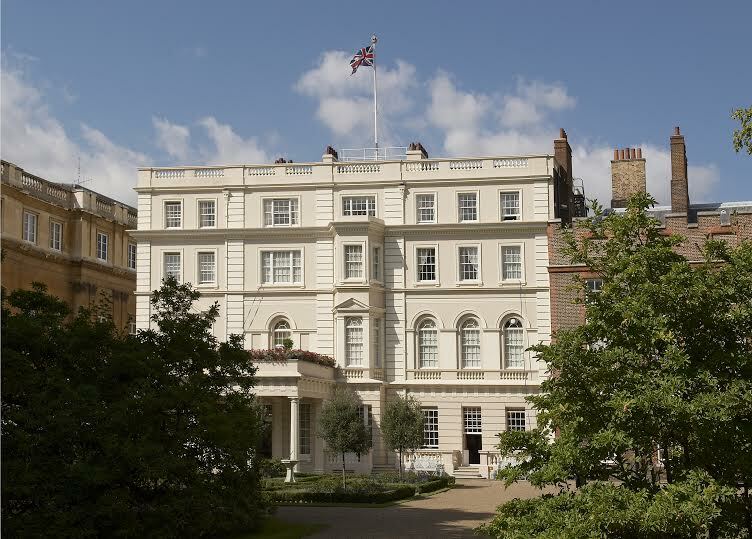 Clarence House was built in the mid 1820s as the London residence of George III’s son William, Duke of Clarence and his wife Adelaide of Saxe-Meiningen who had previously been living in his bachelor pad in St James’ Palace with several of his siblings as neighbours. Clarence, who was generally highly unfussy about his living conditions was nonetheless aware that this was not a suitable arrangement for a married man and so called in John Nash to design him a house that was both suitably grand and also comfortable. Happy to remain within the warren like precincts of St James’ Palace, he took over a plot of land on the south west corner of the palace and it was there that his house was built. Although it is now accessed by the public from the Mall, Clarence House’s main entrance was originally the one that faced on to the stable yard of St James’ Palace – a rather more private arrangement. 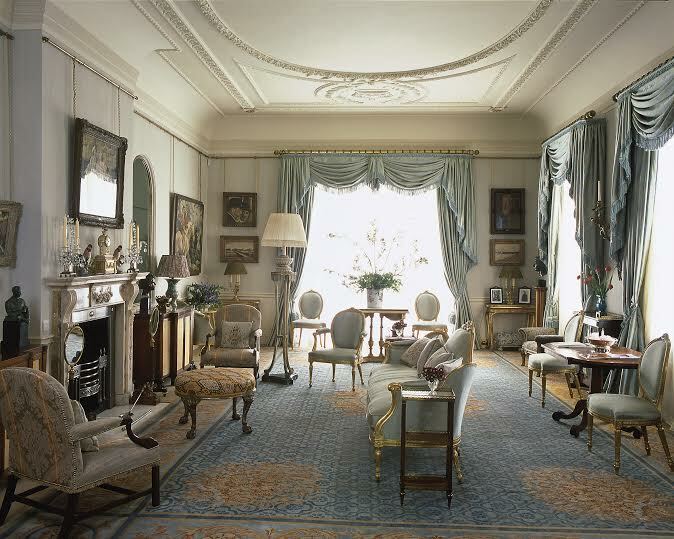 In keeping with the simple tastes of its first residents William and Adelaide, the interior of Clarence House is much more reminiscent of a comfortable London mansion than a palace and has none of the opulence and grandeur of the other royal residences, although it is not without a certain refined elegance of its own, which is perhaps far more becoming. 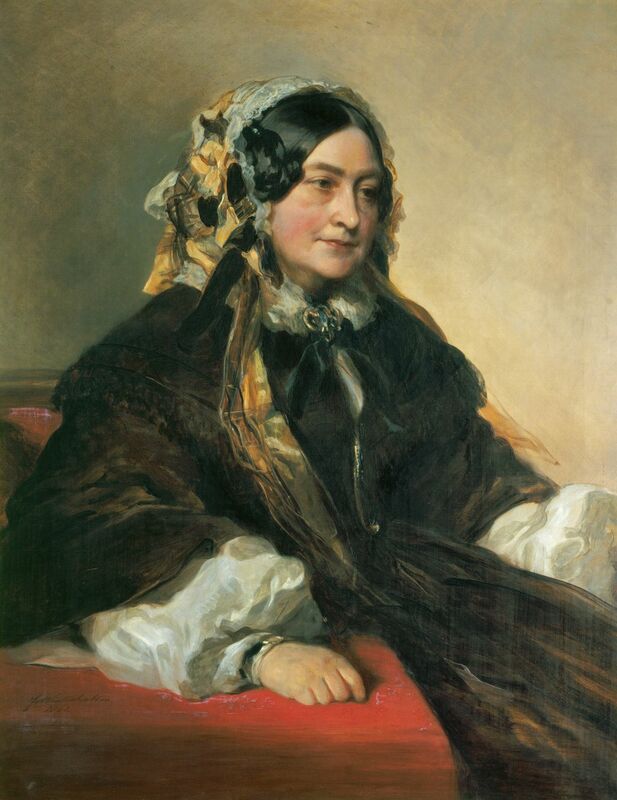 After the Duke of Clarence succeeded to the throne as William IV and moved into Buckingham Palace, Clarence House was lived in by a succession of royals, starting with his sister Princess Augusta and then his hated sister in law Victoire, Duchess of Kent (the mother of Queen Victoria), who lived there between 1841 and her death in 1861 and would frequently entertain her bevy of grandchildren, upon whom she doted, there. After the Duchess’ death, her daughter commissioned a series of watercolours by James Roberts, which show Clarence House as it looked in her lifetime with her arrangements of family portraits and various little knick knacks in every room. Victoria, Duchess of Kent, Winterhalter, 1861. Photo: Royal Collection Trust/© Her Majesty Queen Elizabeth II 2015. 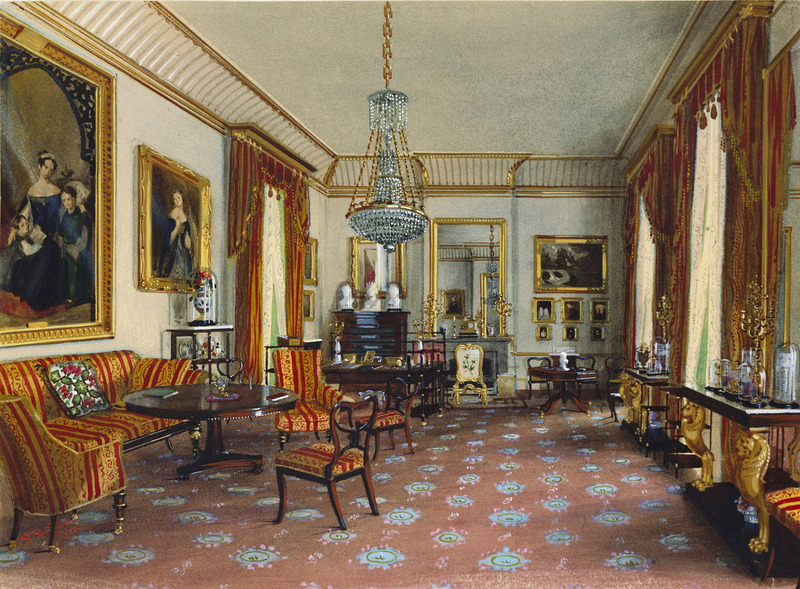 The Duchess of Kent’s sitting-room in Clarence House, 1861, James Roberts. Photo: Royal Collection Trust/© Her Majesty Queen Elizabeth II 2015. Prince Alfred, Duke of Edinburgh, the second son of Queen Victoria and one of the Duchess of Kent’s favourite grandsons, was destined to be the next resident of Clarence House when he took possession in 1866. When Prince Alfred married the Grand Duchess Maria Alexandrovna of Russia, only daughter and favourite child of Tsar Alexander II, in January 1874, he immediately began renovating his London residence for his rather exacting new bride who accompanied him back to England a few months after the wedding. Sadly, Clarence House was not nearly opulent enough for the new Duchess of Edinburgh’s extremely grand tastes, but then again nor were Buckingham Palace or Windsor Castle, both of which she dismissed as being not nearly so impressive as the Winter Palace in St Petersburg. Although Prince Alfred relocated his family to Germany after succeeding his rakish uncle Ernest as Duke of Saxe Coburg and Gotha in 1893, he continued to use Clarence House as his London base whenever he visited. However, his wife could hardly wait to get rid of it after his death in 1900 and it passed into the hands of his younger brother Arthur, Duke of Connaught and Strathearn, who had always been Queen Victoria’s favourite son, and his wife Princess Louise of Prussia who made it their London home until the Duke’s death in 1942. Maundy Thursday, Edward Halliday, 1952. Photo: Private Collection. 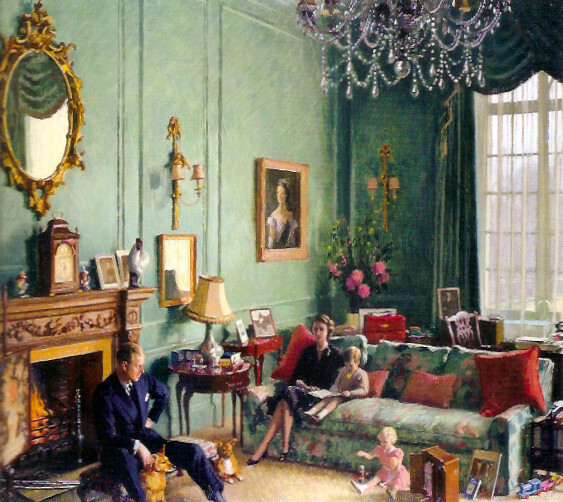 This shows the Queen, Prince Philip and their two eldest children in the sitting room at Clarence House soon after her succession to the throne. Clarence House remained empty until the late 1940s when it was extensively refurbished in the wake of the marriage of Princess Elizabeth and Prince Philip, who planned to make it their London residence. The royal couple moved into Clarence House in June 1949 with their baby son Charles, who had been born in Buckingham Palace the previous November. 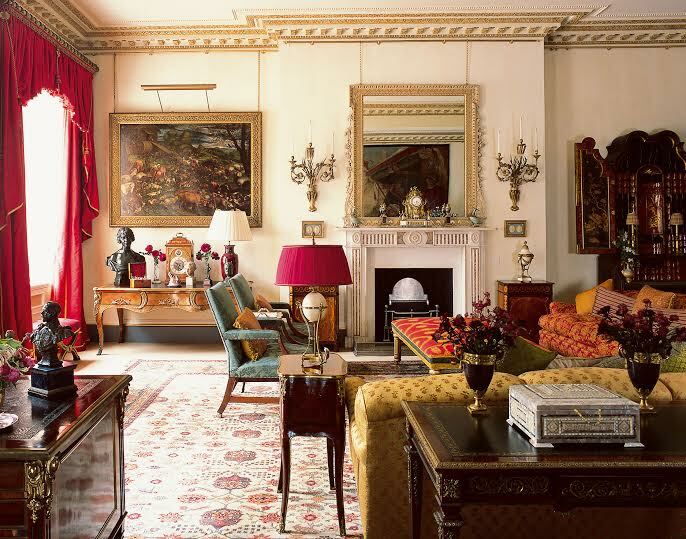 The new residents of the house were both young, still in their early twenties, and wished to recreate the cosy, informal ambience that they remembered from their own childhoods in their home, which meant getting rid of the gilding and fuss installed by previous inhabitants and instead decorating it in soft, pale colours and comfortable furniture, leading Christopher Hussey to describe Clarence House as a ‘sunny, cheerful, happy house, appropriately spaces but reasonably compact, fit for a future Queen… Yet there is also a modern note of simplicity.’ The young couple’s second child, Princess Anne, was born in Clarence House in August 1950. When Princess Elizabeth succeeded to the throne in 1952, she effectively swapped houses with her mother, moving to Buckingham Palace while the now Queen Mother took on Clarence House, where she would live until her death in 2002, sharing the residence with her younger daughter Princess Margaret until the latter’s marriage in 1960. My grandfather was in the guards at the time and fondly remembers seeing the princess come back to Clarence House in the early hours of the morning after a night of partying! Although the house’s previous inhabitants made plenty of changes to both the building and its interior, none of them made quite so much of a mark as the Queen Mother, who filled the house with her wonderful and rather quirky art collection and imbued it with her own warm and charming personality during her decades there. It’s no wonder therefore that her grandson Prince Charles, who was sincerely devoted to her, was keen to move in with his sons Princes William and Harry. Sixtieth birthday portrait of Queen Elizabeth the Queen Mother, 1960. Photo: Royal Collecion Trust/© Her Majesty Queen Elizabeth II 2015. 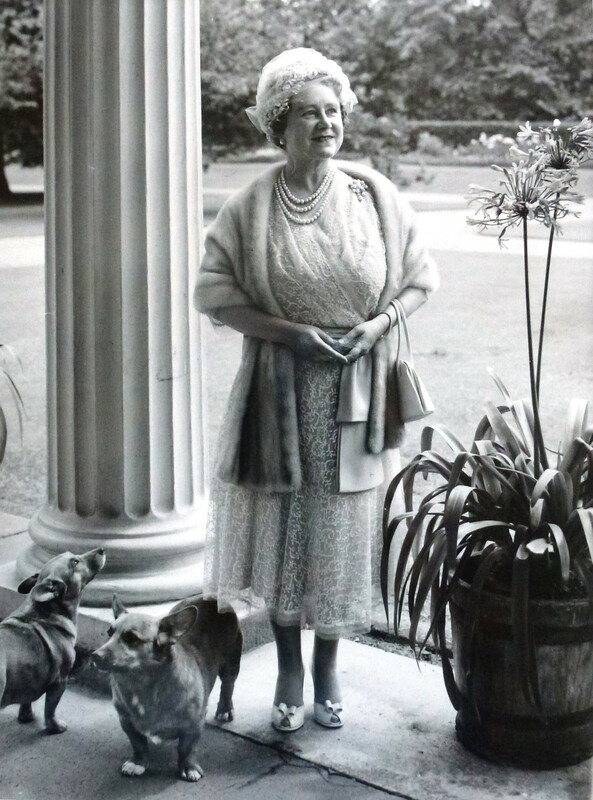 This photograph was taken on the porch at Clarence House. Visiting Clarence House today is a very special experience and a very different one to visiting most royal residences with their abundances of gilt, precious paintings and crystal chandeliers. Although there is an amazing collection of rarely seen royal portraits on display in the rooms, the atmosphere is still homely and welcoming and you get a real sense that this is a much loved family home rather than a museum to times past. As with Buckingham Palace and Windsor Castle there is an almost eerie sense of deja vu though as you walk around as the rooms are so familiar to us all as the backdrops to lots of royal photographs, such as the shots of the newly married Duke and Duchess of Cambridge leaving for their evening party at Buckingham Palace on their wedding day or Prince George’s official christening photos, which were taken in the morning room. If you think that you’re going to get a peek into the royal bedrooms then you will be sadly disappointed as the visit, which involves being taken around in a small guided group, only takes in some of the reception rooms on the ground floor but if you want to have a glimpse of a real royal residence then this is an absolute treat. The visit starts with a stroll through the beautiful gardens, which were laid out by Prince Charles in memory of his grandmother, the Queen Mother. You then ever through a doric portico which leads to the entrance hall, where there are some wonderful paintings, particularly one of a seventeenth century Lady Bowes, whom I assume is a relative of the Queen Mother. The Morning Room, Clarence House. Photographer Christopher Simon Sykes. Visitors are then taken through to the Lancaster Room, a comfortable and rather masculine sitting room filled with books and some unusual royal portraits as well as some striking paintings of London and Windsor Castle during WWII. Although Prince Charles had the house extensively refurbished when he took up residence, he still retained many decorative touches added by his mother and grandmother over the years such as the beautiful decorative chimneypiece in this room, which was bought with money presented by the people of Lancaster as a wedding present to the Queen and Prince Philip in 1947. In a lovely touch, Prince Charles also arranged for some private family photographs of himself playing with his grandson Prince George to be placed on tables, which was really generous of him, I thought and just added to the sense that we were being actively welcomed into his home. However, while everyone else was cooing over young George, I was fascinated by the glass fronted bookcase next to the fire where, we were told, the unpublished memoirs of the Queen Mother are kept. Crikey. Just imagine getting your hands on those! Although you are very aware that this is a modern royal residence, the Queen Mother’s presence can be felt everywhere. Not in a spectral sense, of course, but rather in the fact that the walls are still covered with her wonderful and rather unique art collection, much of which comprises preparatory oil sketches, unfinished paintings and informal portraits. There are some amazing examples of her taste in art in the morning room, which, as the name implies, is the sunniest and most pleasant of the rooms that we saw. There’s a wonderful painting of the young Princesses Elizabeth and Margaret on horseback in the far corner and a very lovely study of the Queen Mother herself, painted by Sir Herbert Gunn in 1945 as a preparatory sketch for his portrait. The Garden Room, Clarence House. Photographer Christopher Simon Sykes. We were then taken through the library, which is where the Clarence House Christmas tree is decorated by specially invited children every year, assisted by the Duchess of Cornwall and a guardsman in full uniform who places the star at the top of the tree with his sword. After this, we were told, the children are treated to a special lunch in the adjoining dining room where the Duchess herself serves them. How lovely is that? 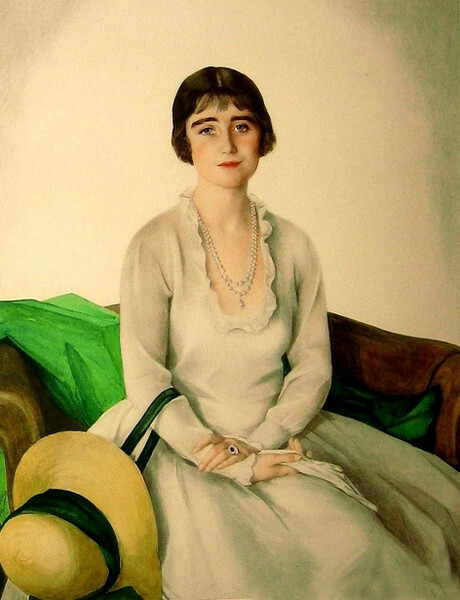 I was particularly taken with a very beautiful pair of portraits of the Queen Mother as a young woman, painted in 1923 by Savely Sorine and her daughter Princess Elizabeth painted a few years later at around the same age and in much the same pose. During the rest of the visit we took a look at the beautiful dining room, inner hall, ‘horse’ corridor (lined with racing paintings collected by the Queen Mother) and then finally the tranquil Garden room which was created by the Queen Mother during her residence in Clarence House, before we went outside to enjoy the gardens in front of the house again. HRH The Duchess of York, 1923, Savely Sorine. This lovely portrait hangs in the library of Clarence House. Clarence House is open for a few weeks over the summer and is a much recommended treat for anyone interested in the royal family both of the present and past. You can find out more on the Royal Collection’s website.